The view down Broadway from Berkeley Square in the days before cars. IT HAS BEEN SAID that we are all residents of the same country called the past. No place values its past more than Saranac Lake, and Arcadia Publishing’s Images of America: Saranac Lake will be warmly welcomed here. Authored by Neil Surprenant, director of the Joan Weill Adirondack Library at Paul Smith’s College, and drawing on several hundred photos from the Adirondack Room of the Saranac Lake Free Library, the book brings our old community back to life. The book is organized into thematic chapters picturing the village in the nineteenth and twentieth centuries. “Making a Living,” the first chapter, captures the hard-working men who peopled this area: the lumberjack in the winter woods, men digging a trench for a water main on Bloomingdale Avenue, a proud bartender at Blood’s Hotel, the Munn brothers posing in their grocery on Main. Here, too is a wonderful portrait of William Kollecker, the man to whom we are indebted for many of these photos. The business that shaped Saranac Lake, the treatment of tuberculosis, is documented with a photo of E.L. Trudeau in his buggy—this is the man who not only built the industry, but who also was Saranac Lake’s first village president. Citizens the world over came to take Trudeau’s cure. Robert Louis Stevenson’s cottage during the winter of 1887-88 reminds us of the many artists who put us on the map. Six Norwegian sailors who came to cure, marooned by the Nazi invasion, stare uncertainly at the camera in another photo. How many of us know there is a section of Pine Ridge Cemetery dedicated to them? The chapter “Downtown” shows us the built environment of an earlier time as well as activity on the streets, from celebrations to disasters. Among other things, the photos show a flag-draped Berkeley House on Main Street welcoming President Benjamin Harrison, in town in 1890 to dedicate the new high school; women parading at Broadway and Main in support of suffrage; the Hotel Saranac under construction in 1926; Buster Crabbe riding up Broadway on a striking white stallion, looking every inch the action hero of the day; and the ruins of the icicle-draped Berkeley Hotel after a fire in January 1981. 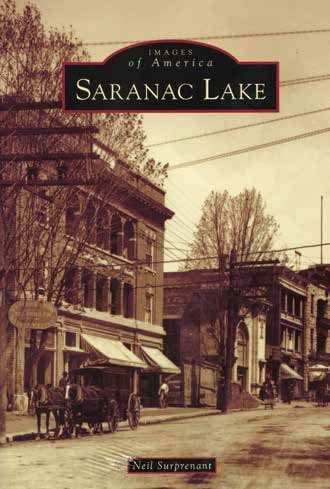 A great joy of Saranac Lake is that it’s not simply a collection of photos about a lost village. Through the hard work of groups like Historic Saranac Lake our community has managed to preserve much of its heritage. 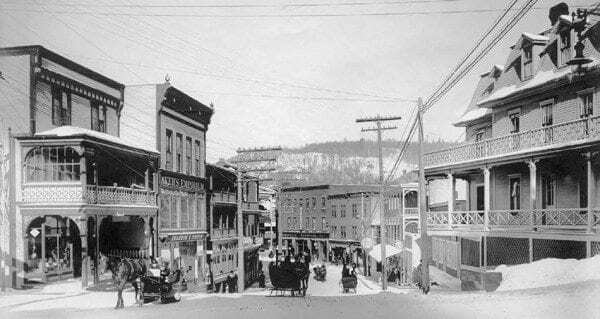 Standing on Main Street today looking toward the town hall from Berkeley Square one sees the same group of buildings captured in a 1907 photo of Adirondack Bank. Saranac Lake is about continuity of community and of tradition. Concise captions trace changes in building ownership and use, providing a wealth of detail about the history of local businesses: Durgan’s Grill was “a popular spot for dining and dancing in the 1950s and 1960s. Proprietors Bea and Mose LaFountain were jazz fans who brought in some of the best talent in the country. The building later became Muldowney’s Steak House, then the Club 86. Today the site is the home of Tissot Construction.” Longtime residents will revel in the reminiscence. Many of the earliest photos in the “Around the Village” chapter are of firsts: the first car to visit in 1902; the first plane to land, on Bloomingdale Avenue, in 1912; the first St. Bernard’s Church ablaze, flames leaping up its steeple, on St Patrick’s Day in 1909. And you’ll love the old cars! The photo on page 27 leaves me pining for a 1935 three-window coupe. The book closes with a chapter devoted to Winter Carnival, our iconic community celebration. There are photos of a spectacular 1909 Ice Palace; an ice pyramid at Broadway and Main; parade floats large and small, from family sleighs to an ice sculpture of the Brooklyn Bridge by the Paul Smith’s Hotel Company in 1915; photos of Carnival Royalty from the 1950s, depicting personalities such as King Don McNeill and Queen Fran Allison, who broadcast their national radio program, Breakfast Club, from the Pontiac Theater during the carnival. 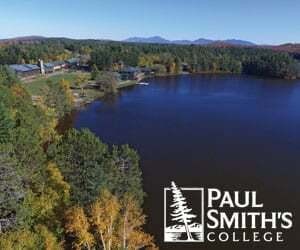 Kirk Peterson taught Adirondack history at Paul Smith’s College and serves on the Education and Events Committee of Historic Saranac Lake.